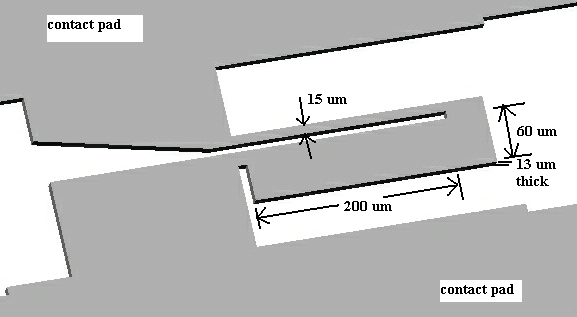 Above is a Solid Works drawing of a thermal actuator or "heatuator". When an electric current is passed through, the 15 m wide "thin" arm gets hotter than the 60 m wide "fat" arm, and therefore thermally expands more. This causes the actuator to bend in the direction of the "fat" arm. This device is manufactured out of 13 m thick stainless steel sheet metal using the Microlaze laser micromachining process. Currents of up to 250 mA will actuate the heatuator. Already at 250 mA, the device glows red hot and will burn up if sustained. 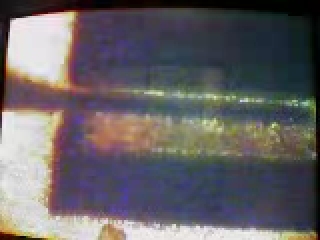 Here is a picture of the heatuator before and after activating with 200 mA. Following are short RealVideo clips of the heatuator being actuated at various currents. They are shown in real time. Heatuator at 250 mA. You can see the device glowing red hot. The ambient illumination is changed twice during the clip to show this. Also, at the end of the clip, the current is run continuously until the device fails. You can see the thin arm is broken. 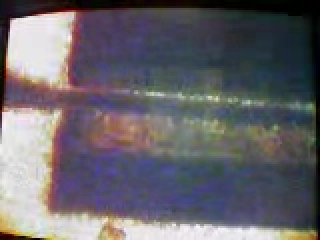 These videos show various currents being passed through a simple 15 m thick arm. Because the arm is held between two stationary pads, its thermal expansion causes it to bend up. Simple arm at 375 mA. This clip has no ambient illumination so you can see that the arm really does glow red hot in the dark. At the end of the clip, the current is turned past 375 mA (to around 400 mA) so that the device fails and breaks in the middle.